As I write this, one can hardly avoid the hyperbole concerning America’s Fiscal Cliff drama---all huffery and very little substance. The Washington Post, NPR, Reuters, ABC News, Wall Street Journal, CNN, CBS, Fox, Forbes, the Chicago Tribune, Huffington Post and USA Today are full of breathless puffery. What to do? Where to run (other than toward your favored extreme)? The sky is falling and life will never be the same. Wall Street stands transfixed like a deer in the headlights, fingers in their butts with a look of abandonment reflected in those well fed eyes. Something must be done, they all rant and by something, they mean their particular something. The better question is should something be done? This not-so-humble commentator thinks no, nothing should be patched together in a last-ditch effort to avoid enforcing the Budget Control Act. Leave it the hell alone and cruise on over. It’s not a cliff anyway, but far more of an ‘if’ we don’t do that, this will be the outcome. And in this case, the disease is far preferable to the cure, should you think an Obama-Boehner compromise would actually cure anything. By doing nothing, the Budget Control Act will trigger automatic tax and spending cuts. Both taxing and spending have their arguments and that debate leaves much to be said by both sides, not all of it wrong. Even so, letting ‘if’ happen will cut the deficit, as a percentage of GDP, in half. There’s pain in kicking the we-can-have-it-all habit, just as there is in getting personally off cocaine. There are withdrawal symptoms. But Congress has been kicking this particular habit down the road for decades and the time for quitting cold-turkey is upon us. Half hearted agreement between Boehner and Obama, which satisfies neither side and certainly solves no inherent problems, is just one more kick down the road. The reason I’m so against Boehner and Obama slapping a Band-Aid on the crisis is that, having done so, Congress will go back to its decades-long snooze and finger pointing will forever thwart logical and needed legislation. Turning away at this juncture and letting January 1st deal the hand it is designed to deal will hold everyone’s feet to the fire and that is exactly where Democrat and Republican feet need to be. The nation’s feet as well. You and I are among the enablers of the mess in which we find ourselves. Distracted and entertained, we the electorate failed our duty in the magnificent bargain that is representative government, snoozing our own way through the past four decades and getting fat on the couch. 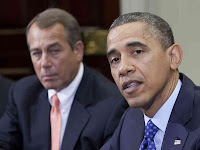 Will this so-called and overhyped ‘fiscal cliff’ drag us back toward recession? Most probably. But recession is where we deserve to be and likely what is required of us to solve our economic and social misdeeds. The case can be made that endlessly printing money to ease the pain does nothing to heal our broken leg. We are limping as a nation. This is the moment we decide to either repair the fracture or take another handful of aspirin. Simply smothering the pain is a sure way to turn a limp into a crippled life and if you don’t think America is on crutches, you haven’t been paying attention. The income tax structure is a disaster; unfair, inequitable and uncollectable to the tune of half a trillion dollars a year. Ignoring Eisenhower’s warning to beware the military-industrial complex, we fight hopeless wars and police the planet without any shared cost from the rest of the world. Our trade policies encouraged the business community to off-shore every American job that wasn’t nailed down. The middle class, our proudest and most envied achievement, is in crisis and shrinking by the day. Freedom and democracy are increasingly overwhelmed by an oligarchy that owns the United States Congress through payoffs and fraud. Our infrastructure is falling apart. A nation built on immigration founders on that policy, our states face bankruptcy and our prisons incarcerate one in thirty Americans, at a cost per prisoner that rivals a Harvard education. We have the most expensive and least effective healthcare system of any developed nation. Home foreclosures have increased tenfold in ten years and tens of millions of families are one job loss or medical crisis from bankruptcy. If that’s not a nation well on the path to crippling social and economic disease, it would be hard to find one that better fits the definition. Yet all these difficulties can be undone by reversing the process that exacerbated them and paying attention to the unintended consequences of quick fixes. There is more than hope for America, there is great hope. But it will not happen by itself, nor will it occur without public participation. We can’t send a president off to fix it and go back to our couches and Monday Night Football. January 1st is not a cliff unless we allow it to become one. It is an opportunity to pick up that can we so recklessly kicked down the road and examine it. So I am hopeful rather than worried about the oncoming ‘fiscal if.’ Let’s get on with the work at hand, the job that must be done, instead of the process we avoided and turned our backs upon for far too long.